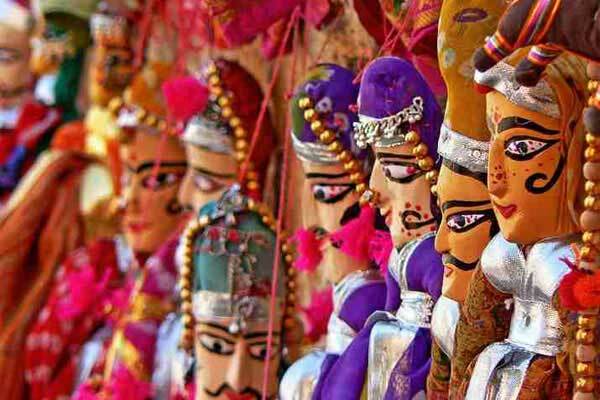 Cultural Rajasthan Tour encompasses all the four regions of Rajasthan. These four regions of Rajasthan have different cultures, dialects, architectural styles, history, legacy, attires, fairs, festivals etc. Cultural Rajasthan Tour helps you explore the colorful bazaars, the myriad topography of the Thar Desert, the native people, and colorful fairs and festivals of Rajasthan while covering Delhi, Mandawa, Bikaner, Jaisalmer, Jodhpur, Kumbhalgarh, Udaipur, Bundi, Ranthambhore, Jaipur as Rajasthan tourist destinations. On arrival at New Delhi airport, you will be greeted & assisted by Optima India Tourism's representative. You will be transferred to Delhi hotel. Our representative will ensure smooth check in at the hotel. As most of the international flights land in India at late night, so have sound sleep in Delhi hotel to get relaxed for the sightseeing tour of Delhi next day. Have delicious breakfast in Delhi hotel and proceed on for Old & New Delhi sightseeing tour along with Delhi tour guide. The Old & New Delhi tour encompasses visit of Red Fort (remains closed on Monday), Jama Masjid, Chandni Chowk, Akshardham Temple (remains closed on Monday), India Gate, Rashtrapati Bhavan, Qutub Minar, Sansad Bhavan (Parliament of India). It will be relaxed and leisurely tour and help you understand 'exoticism' of India. After visiting famous monuments of Delhi, later in the evening, return to hotel for overnight stay. Have a very hearty breakfast in Delhi hotel and then drive to the town of stunning havelis – Mandawa – located in the heart Shekhawati region of Rajasthan, India. Visit the famous painted archways decorated with murals depicting Lord Krishna herding his cows towards the bazaar. After exploring Mandawa, in time return back to the hotel for overnight stay in Mandawa. Having tasted succulent breakfast at Mandawa hotel, drive to the Camel City of Rajasthan– Bikaner, predominantly famous for its stunning havelis, camel breeding farm, Lalgarh Palace, Junagarh Fort and Karni Mata Temple. Upon arrival in Bikaner, Optima India Tourism representative will assist you in transferring and getting checked in at the designated hotel of Bikaner. After relaxing for some time in Bikaner hotel, you will be taken on sightseeing tour of Bikaner which primarily includes magnificent Junagarh Fort, splendid Lalgarh Palace and the Camel Breeding Farm & Research Centre. Spend rest of the day at leisure and have night stay in Bikaner hotel. Day 5 Bikaner- Jaisalmer (335 kms/6 hrs). Bikaner to Jaisalmer road travel is the longest stretch. After early morning breakfast in Bikaner hotel, proceed to Jaisalmer in the state of Rajasthan India. On arrival at Jaisalmer, you will be received by Optima India Tourism representative and transferred to hotel. After being relaxed for some time, move on a half day leisurely sightseeing tour of havelis of Jaisalmer. The prominent havelis are Nathmalji-ki-Haveli, Patwon -ki-Haveli and Manak Chowk and Havelis. Manak Chowk is a main marketplace outside the fort leads to the narrow lanes dotted with famous havelis. 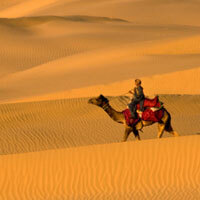 After enjoying relaxed but vivid sightseeing of Jaisalmer, return to Jaisalmer hotel for overnight stay. You will be picked up by the car from your tent in the morning. Depart for Jodhpur after having delicious breakfast in Jaisalmer. Upon arrival in Jodhpur, the Blue City of Rajasthan, Optima India Tourism representative will assist you to transfer to the designated hotel. Have sumptuous lunch in a nice restaurant and proceed for visiting famous monuments of Jodhpur with Jodhpur tour guide who will meet you in the lobby of Jodhpur hotel. Visit the mammoth Mehrangarh Fort and explore beautiful palaces and temples within the fort complex. Also visit the Clock Tower, the Umaid Bhawan Palace & Museum, the Jaswant Thada – the royal cenotaph memorial, and other tourist spots. Also explore the famous Sardar Market. After exploring local market, return to Jodhpur hotel for overnight stay. Having taken sumptuous breakfast in Jodhpur hotel, proceed for Kumbhalgarh. On the way to Kumbhalgarh, have a stop-over at Ranakpur, one of the most famous Jain temple town of Rajasthan, India. 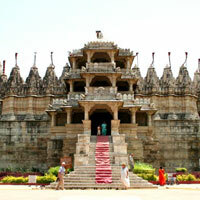 Visit Ranakpur temple, located in pleasant idyllic set up. After visiting Ranakpur temple, proceed for Kumbhalgarh which is almost 35 kms away from here. On arrival at Kumbhalgarh, you will be received by representative of Optima India Tourism to ensure smooth check in at the pre-booked Kumbhalgarh hotel. Taking delicious breakfast in heritage hotel of Kumbhalgarh, stroll along with Kumbhalgarh tour guide to explore the magnanimous fort palace complex of Kumbhalgarh. Early afternoon, depart from Kumbhalgarh to Udaipur, the City of Lakes. On arrival at Udaipur, representative of Optima India Tourism will receive and transfer you in Udaipur hotel. Spend the evening in leisure and spend night in Udaipur hotel. After breakfast in Udaipur hotel, proceed for Bundi, a principality of Hada Rajaputs of Chauhan clan. Bundi offers a tourist relatively off the track destination which is grand yet less frequented by the tourists. Due to this, Bundi presents true culture and heritage of Rajasthan. On arrival at Bundi, you will be transferred to Bundi hotel. After relaxing a bit, proceed for visiting famous monuments and tourist destinations of Bundi which include visit of the Taragarh Fort, Bundi Palace, Chhattar Mahal, Ratan Daulat, 84 Pillared Cenotaph and Baori. Overnight stay in Bundi hotel. After relaxed breakfast in Bundi hotel, proceed for Ranthambhore Wildlife Sanctuary in Sawai Madhopur district of Rajasthan. Early afternoon, arrive at Ranthambhore National Park. Check in at the jungle resort with welcome drink in honour. Ranthambore wildlife sanctuary is known for its tigers and is one of the best places in India to see these majestic predators in the jungle. Spend the afternoon and evening in leisure, enjoying natural habitat of a jungle. 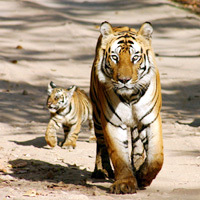 Have dinner and overnight stay in Ranthambhore hotel. Have breakfast in Ranthambhore hotel and proceed for Jungle safari by Jeep/ Canter on sharing basis in Ranthambore National Park for 04 hrs, from 07:00'Oclock to 10:30'Oclock. After jungle safari, return to the hotel and have lunch. Having lunch, proceed again for jungle safari by Jeep/ Canter on sharing basis in Ranthambore National Park for 04 hrs, from 02:00'Oclock to 05:30'Oclock in the evening. After tiger safari, come back to resort and enjoy the evening tea with camp-fire. Later in the night have dinner and overnight stay in Ranthambhore hotel. After a relaxed breakfast in jungle resort of Ranthambhore National Park, drive to the Pink City – Jaipur, the capital of Rajasthan. On arrival at Jaipur, representative of Optima India Tourism will receive you and transfer to Jaipur hotel. He will ensure smooth check in at the pre-booked Jaipur hotel. After relaxing for an hour or so, you will be taken to visit Albert Museum, Monkey Temple and Birla Temple of Jaipur. At Birla Temple, witness enchanting evening 'deity worship ceremony', a traditional Hindu practice of paying respect and commemoration of God. After visiting Birla Temple, return to Jaipur hotel for overnight stay. Mandawa is known as "The Open Air Art Gallery". Mandawa is dotted with fascinating mansions (havelis) that have lavishly painted walls. It was a trading outpost for the ancient caravan routes that stopped here from China and the Middle East. Mandawa, an important town of Shekhawati region of Rajasthan, is the land of multi-hued frescoes depicting mythological and historical themes. Bikaner's lust for "dessert" or affection for "desert" tickles every heart to visit Bikaner. Bikaner, the desert city of Rajasthan draws large number of tourists for its picturesque golden sand dunes, striking red sandstone forts, stunning palaces and havelis and certainly its camel safaris. The city boasts of having the best camels and has the largest Camel research and breeding farm in the world, hence the name camel country. The camel festival is also a major tourist attraction. Kumbhalgarh, 65 kms from Udaipur, is famous for its un-surmountable fort and being birth place of legendary Maharana Pratap. 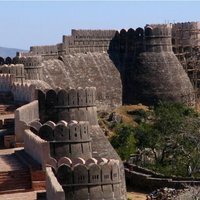 Named after Rana Kumbha, who got the fort constructed in the 15th century, Kumbhalgarh Fort is another fort that has remained unconquered till date. This was so because of its inaccessibility and hostile topography. The fort walls are wide enough for eight horses to run simultaneously. The most amazing and interesting fact about the fort is that it houses another fort in its complex. This fort is called Kartargarh fort and comprises of a palace built by Maharana Fateh Singh. Beautiful lakes, picturesque scenery, grand monuments, picture-perfect hilly back-drop has compelled the visitors to call Udaipur as 'city of lakes' and 'Venice of East'. Udaipur is regarded as one of the most romantic cities of the world. Udaipur is the second most-sought after tourist destination of Rajasthan. Lake Palace of Udaipur has been accredited of being one of the most romantic places all across the globe. The massive forts of Udaipur grab the interest of people with their sheer structure and architecture. The beautiful temples create a sense of aestheticism with their spiritual ecstasy. Udaipur also boasts of various museums, palaces, gardens, monuments and colorful festivals that allure tourists to visit the city for once. Udaipur Solar Observatory is considered as the best solar observing site in Asia. 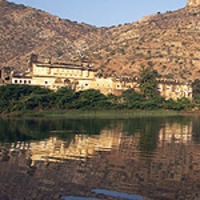 Other attractions are City Palace, Jag Mandir Palace, Lake Palace Udaipur, Lake Pichhola etc. Bundi has almost all cultural & architectural niceties of Rajasthan but is less frequented by the tourists. Rustic environment, pristine glory, glorious monuments and comparatively lesser touristic and commercialized ambience offer a tourist a feel of 'old world charm'. Bundi is small but exceptionally unique town of Rajasthan. It's famous for its magnificent fort, beautiful palaces, havelis (mansions), chattris (cenotaphs) with carved pillars, and amazing baoris (step-wells). Bundi is also world-renowned for its miniature paintings. Explore Bundi with Optima India Tourism to experience this fascinating town of Rajasthan at its best. 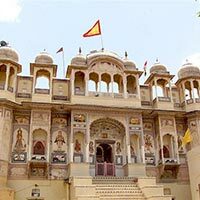 There are a number of enchanting tourist attractions in Bundi, which you can see on Bundi tour. Ranthambhore, a National Park developed as Royal Bengal tiger reserve, is home to over 40 species of mammals, 320 species of birds, over 35 species of reptiles and over 300 species of plants. Ranthambore wildlife sanctuary in Sawai Madho Singh district of Rajasthan, is known for its tigers and is one of the best places in India to see these majestic predators in the jungle. Tigers can be easily spotted even during the day time. Jaipur, the capital city of Rajasthan, has been laid according to the conventional nine-grid pattern that astrologers believe to be lucky, and which has been recommended in the ancient Indian treatise on architecture. Jaipur has much to offer visitors — everything from pageants and festivals to extraordinarily clad people, a wealth of handicrafts, a royal legacy of palaces, and sightseeing — that will occupy their time. Jaipur is also known as 'Pink City' and famous for magnificent monuments like Amber Fort, Jaigarh Fort, Nahargarh Fort, Jal Mahal, City Palace, Jantar Mantar, Hawa Mahal, Galta Ji, Birla Temple, Albert Hall etc. Being almost equidistant from Delhi and Agra, Jaipur along with these two cities form a Golden Triangle circuit. Total Meals: 20 (Breakfast-15; Lunch-02; Dinner-03). Total night stays: 15 (Delhi-02; Mandawa-01; Bikaner-01; Jaisalmer-02; Jodhpur-01; Kumbhalgarh-01; Udaipur-02; Bundi-01; Ranthambhore-02; Jaipur-02). Manual rickshaw ride in the alleys of Kinari Bazaar, situated in 400 years old . Chandni Chowk market, built by Shah Jahan and supervised by Jahanara. City of desert state of Rajasthan. Jeep safaris in Ranthambhore, a Royal Bengal Tiger reserve. Do watch medieval era's still working water harvesting system- the baoris in Bundi.